Being handsome, clever, and rich, it's plain that Jane Austen's Emma Woodhouse would have been well-dressed. But how well, we've all asked, has the film and television industry dressed the Emma adaptations? I'm going to attempt a novice costumer's study of the female wardrobes produced for the1996 film version, starring Gwyneth Paltrow and costumed by Ruth Myers ( Emma 2 ), and the 1996/97 television adaptation, starring Kate Beckinsale and costumed by Jenny Beavan ( Emma 3 ). A few brief notes on the 1972 serial, starring Dorin Godwin and costumed by Joan Ellacot ( Emma 1 ), will conclude the piece. The two recent versions of the story represent two different treatments of Regency-era clothing. The designers of each sought to "code" and reflect characters, moods, and situations through costume metaphor - this includes choice of fabric, colors, styles, accessories, and the like. However, while the television presentation, costumed by Jenny Beavan, sought to recreate the particular period during which the novel was written and published (1814-1816), Ruth Myers and the 2 team chose an earlier and more generalized sort of look. Since the last out of the gate is usually the freshest in everybody's memory, I'll start with Emma 3 . Judging by Jenny Beavan's goals and her chosen year of costume (1915), I'd say she did a pretty good job. I'm certainly no expert, and some of my comments may be downright bogus despite my efforts at accuracy, but I think just about everyone's in consensus that this was the most believable and realistic lot of Emma costumes we've gotten (Beavan won an Emmy for this production). Beavan's earlier work included dressing the cast of 1995's Sense and Sensibility and 1986's Room With a View . Those who've seen these films will recognize the fact that she loves lapelled pelisses (see photo, right), and works them in wherever she can. The Dashwood sisters, Lucia Honeychurch, and Emma Woodhouse all wear strikingly similar outerwear, despite the several-year span separating the two "vertical" era films and the century-span separating the "vertical" productions from the Edwardian one. "...but by the time of Emma you're beginning to get a bit of a peak on the shoulders and a little puff on the sleeves. The skirt length is somewhat shorter and more practical, its shape has become rather more triangular, and you no longer get trains on the frocks." 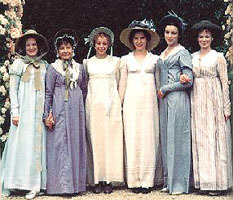 Ironically enough, some of the gowns in this adaptation that best represent the heightened "triangulation," as opposed to the fluidity of the early 1800's and the straight tubularity of the middle years of the era, are the ones that look most like the long, fluid concoctions she made for S&S (see photo, left). The cotton crossover-bodiced gowns worn by Miss Bates (second from left) and Jane Fairfax (second from right) at the Donwell Strawberry Outing are illustrative. In most of the other dresses - especially the ball and dinner gowns - the outward slope of the mid-decade skirt, the extravagant flouncing and decoration of the hem, and the relative "shortness" of the skirts aren't readily apparent, probably due to the fact that Beavan wanted to accentuate the provinciality of Highbury fashions. The cutting-edge gowns of the year - especially ballgowns - would have been short, often tiered, and deeply flounced and/or festooned with flowers, vandyking, and other forms of decoration. In addition, their conical slope would be reinforced by the heavily tucked and ruffled petticoats worn underneath. Mrs. Elton - always trendy - is the only major character who's got more than one hem that's full o' frills (she's also got a neck full o'pearls, which would make the literary Augusta beam with pride), and even her frills are nothing to the three-dimensional flowers you see in the fashion plates. Mrs. Elton's robelike blue gown with the gold decoration down the front, worn at the Strawberry outing (see photo, left), looks like a day dress plate from 1813 - a full two years earlier! The plates are always a la mode, and so it's understandable why a fashionable but sheltered country girl of good taste, like Emma, and a serious-minded cosmopolitan one, like Jane, might not look so ostentatiously au courant, but Mrs. E has no excuse! (*Grin*) Mrs. Elton's strawberry gown is, however, despite it's 1813ishness and its curious little quasi-train, an excellent example of the skirt "triangulation," with the added period-correct bonus of a shorter skirt length. Mrs. Weston's Wardrobe is particularly beautiful, and rather stylish - gold trim and embroidery for evening, sari-like prints and weaves, rectangular Indian shawls, and Josephinesque linked-floral necklaces. The team made ample use of trendy "V" necklines with inserts and "crossover V" bodices for this character. Suspiciously, however, I recognized the harvest supper frock and the beige-yellow dinner gown with the vandyked puff sleeves as coming from Susannah Harker's Jane Bennet wardrobe in Pride and Prejudice (1995-96). Perhaps this explains why there's an anachronistic train on the former, as P&P was meant to take place several years earlier. 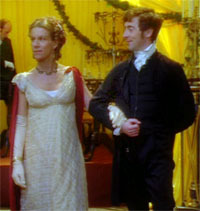 The brown silk, metallic-embroidered ballgown with the insert appears to have been nabbed from Lucy Robinson's Mrs. Hurst wardrobe from P&P , as well. Emma's olive-branch-patterned yellow gown - worn during Jane's first visit to Hartfield - and the near leg-o'-mutton style sleeves (see photo, above right) of Emma's velvet dresses and Mrs. Weston's peach day dress feature two kinds of wider and looser sleeves emerging during the period. Although, Emma's gold ballgown - with tight, 3/4 length sleeves and straight skirt with cascading fullness in back (see photo, left) - seems like something out of the previous decade, despite its very high waist. Mrs. Weston's beigey-peach dinner gown displays a puffed sleeve with a fashionable vandyking overlay (Jane's Wedgewood-blue Box Hill spencer also features lightly-vandyked shoulder caps). The "to the neck" chemisettes worn by Samantha Morton's Harriet are characteristic of the high necklines of 1815, also utilized in the first Emma by Joan Ellacot (in addition to the betsie, which is a separate ruff). All of the gowns feature the very high waists characteristic of the middle and later years of the decade. Beavan is successful at "uniforming" the characters, using particular styles, conventions, and details to magnify and distinguish personalities. For Emma, she chose to replicate a specific gown from the period which featured a short, tucked hem, puffed oversleeves, long undersleeves, and a gathered bodice. She had several frocks copied from it and based the other gowns on its general cut. The "aubergine"-printed muslin frock normally worn under the famous pelisse, and the nondescript white muslin gown worn under the beige overbodice at the Donwell Strawberry Outing and during the proposal scene (see strawberry outing photo, above), are examples of the replicated look. She picked the gown for its understated style, as was the simple and unadorned, yet graceful, crossover-bodice style selected for Jane Fairfax (a short note on Jane's dark gown, worn at her first evening visit to Hartfield: it's probably dark blue rather than black, which would not have been worn by a young woman not in mourning). Beavan and Beckinsale chose rather tall, large, imposing hats for Emma to accentuate her hawkish, aggressive qualities, while the other, more benign females - sweet Harriet and motherly Mrs. Weston, for example - wore less intimidating bonnets (see photo, above right). The look chosen for Miss Bates - comfortable cottons in practical, drab colors worn with grandmotherly little mob caps and fussy fichus - fits her character as well. with Harriet (Toni Colette) in a curious mob cap. 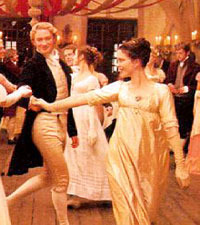 The Miramax film, costumed by Academy Award nominee Ruth Myers, abandoned accuracy to create a more impressionistically "Regency" look - more 1805 than 1815. A smattering of elements from the intervening years is also evident, including Jane Fairfax's contrasting-stripe overbodice ensemble (more like 1811-1812?) and Emma's light blue dress with long, double-puffed sleeves (1814-1815). Though George, Prince of Wales, did not become Regent for his father, George III, until 1810, the classical "Regency" line is represented for me and for others by the long, flowing, relatively unadorned lines of the first decade of the 19th century (and the last years of the 18th). 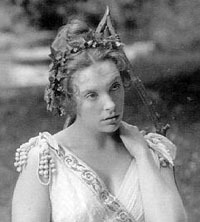 Judging by the open and square necklines, bare arms, long gowns, half-robe style overskirts, and simple trims, Myers was aiming to contribute to the lovely, airy, fairy-tale quality of the production established by the ethereal Rachel Portman score, brightly-lit interiors, and sweeping Dorsetshire landscapes. Color and style represent mood and character beautifully. Since the story is, in essence, about the delusional fantasy-world of a girl with a blessed existence, Myers' fanciful, impressionistic scheme works very well. Emma's crisp, white gown (featured in the riddle scene; see photo, above left), her pink striped archery dress, and her light, crinkled "all-weather" fabric gowns accentuate Emma's youthful, active, and practically beaming personality. Gwyneth Paltrow's general bonnetlessness, bare arms, and carelessly-tossed cashmere shawls illustrate Emma's carefree refusal to face up to the responsibilities and constraints of grown-up propriety. Emma apparently uses only one bonnet, and it's usually not on her head. It is only when she is severely humbled by the possible loss of Mr. Knightley and horrified by her own cruel remark to Miss Bates when she begins to take fashion propriety seriously - as she prays in church for Mr. Knightley's celibacy and tromps to town to make amends with Miss Bates. In these scenes, the bonnet is firmly tied on, and Emma's usual swagger is gone. "I had serious doubts myself, but it turns out the did exist. If you will go to Jessamyn's Regency Costume Companion web site and look at the evening wear the first dress it is a sleeveless Russian regency gown. The web-mistress makes the comment they were not common, but they did exist! It was news to me." Emma (Gwyneth Paltrow) in green. When Mrs. Elton makes her initial visit to Hartfield, Emma wears what I've heard described as a gown of "bilious" green - an apt description! Mrs. Elton's presumptious manner and jaw-clenching condescention are enough to warrant violence, though Emma manages to survive tea without overstepping the boundaries of mere tartness. Mrs. Elton's own wardrobe is hyperbolic, with comically large, imposing bonnets and hats, deep V necklines, sharply-peaked shoulders, overdone jewelry, and an overdramatic, contrasting red-and-cream ballgown (below, right). 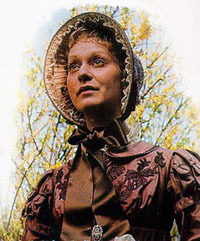 She is contrasted starkly with the other principle matron in the story, Mrs. Weston, whose shawl-collars, bows, and demure caps define her own gentle, refined character. As Harriet poses for her portrait, she wears a rather over-the-top, Grecian, chitonesque gown (see below, left), which, along with her silly pose and lyre prop, exudes ridiculousness. One gets the sense that Emma is crazy to be committing this to paper, that Harriet must be incredibly gullible to sit for its commission, and that Mr. Elton - every feature working - is a obnoxious, insincere, brownnosing gallant for pretending to like the concept. The point is made. In everyday mode, Harriet's wardrobe consists of very "young," childlike ensembles, including button-front bodices, a plaid spencer, and an obviously incorrect mob-cap (a look usually reserved for married women; see photo, above). While more fanciful than realistic, the outfits match Toni Collette's naive, slightly zany portrayal of the sweet but stupid Miss Smith. Ellacot's goal was to make the costuming - and thereby the production as a whole - to "look as genuine and real as possible." She, like Beavan, chose to replicate the looks of 1815. It's easy for today's audiences to dismiss the old BBC costumes as "polyester specials" because of the dating and dulling effects of the videotape and harsh fluorescence used in taping. However, most of the designs used in this production were well-researched and carefully selected. 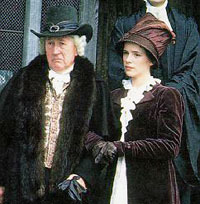 Many of the costumes were reused in later BBC productions during the 1970's, notably the 1979 version of Pride & Prejudice starring Elizabeth Garvie. As with the other Emma s, the design team chose styles, colors, and accessories to indicate class, age, and personality. Harriet wears youthful, patterned frocks in soft colors and bright bonnets. Emma wears regal styles in sophisticated colors, including an ermine-lined cape and a maroon spencer with appliqued designs (see photo, right). Mrs. Weston wears somber colors in modest styles. In general, the costuming here is very, very good, even though one may have to look closer to realize it. I wrote this review for Eleanor Farrell's wonderful Austen page at Celluloid Wrappers, a site devoted to film and television costuming. Please visit it if you haven't already. If you've reached us from Ellie's site, welcome to the Emma Adaptations Pages! Birtwistle, Sue, and Susie Conklin, The Making of Jane Austen's Emma. London: Penguin Books, 1996. Lauritzen, Monica. "Jane Austen's Emma on Television: A Study of a BBC Classic Serial." Gothenburg Studies in English, 1981. Gothenburg, Sweden. Gwyneth Paltrow's wedding gown from Emma 2, at a Huntsville Museum of Art exhibit in 2005. For more images from the adaptations covered in this article, visit our gallery. For a similar piece on the fashions of Northanger Abbey adaptations, visit my piece at Laurel Ann's Austenprose blog.